Price: $19.99 USD and up. 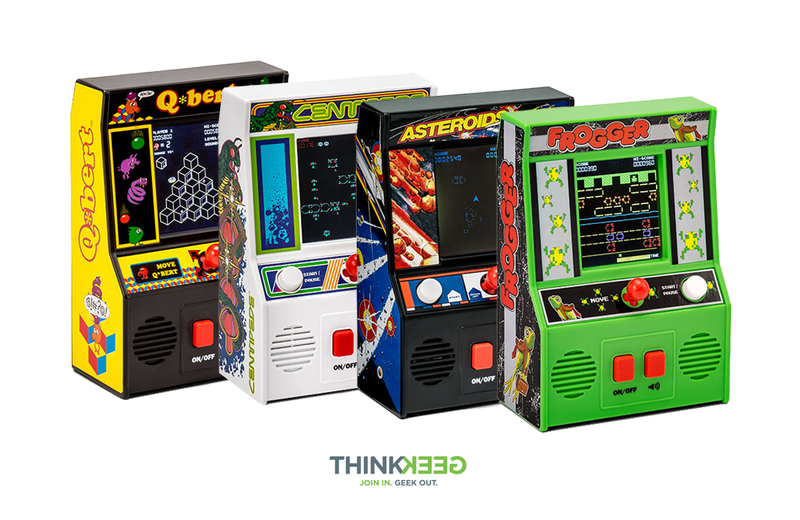 ThinkGeek’s new series of electronic games pays homage to four of the iconic video games of the 1970s and ’80s: Asteroids, Centipede, Frogger, and Q*bert. Each handheld version resembles the classic arcade cabinet design, miniaturized to 5 ¾”-inches tall x 4-inches wide x 2-inches deep. The mini games feature retro graphics and color scheme, on/off and start/pause buttons, and a bright red joystick. Original game sounds are heard through two small speakers and are controlled by a button in the cabinet’s base. Centipede, Frogger, and Q*bert offer 4-colour screens while Asteroids basks in single-colour screen glory. Each game is priced at $19.99 USD and runs on two or three AA batteries, depending on the model – so you can to save your quarters for laundry or the parking meter.